People in Gloucester, Massachusetts were evacuated from their homes due to a hazmat situation. Acid fumes from a bath of nitric acid formed. The hazardous material substance is widely used for the removal of metal coatings. The people who were evacuated from their homes in Gloucester, were back home by Wednesday afternoon. VDEM Hazmat officer Todd Cannon stated that the hazardous material was vulnerable to heat and a heat source must have struck the hazmat storage building that it was being contained in and caused the hazardous material to overheat. The company that was housing the hazardous material is undergoing investigation by the Environmental Protection Agency (EPA) and the investigation has been ongoing since an inspection in 2010. The EPA states that every record of the business from year 2010 states that the company, Advanced Finishing Systems, has been out of the compliance regulations every quarter. People living in the surrounding areas of the hazardous material building had to be evacuated for precautionary reasons. Hazmat teams closed down streets and began to set up their tents. Hazmat officials stated that their hazmat crews wear heavy-duty suits that do not allow any vapor in because there are unexpected risks that go along with the inspection of hazardous materials. The company will begin to face fines from the EPA after the inspection is resolved. Hazardous Materials are any toxic materials that may be a threat to society or the environment. Hazardous materials are used everywhere. They increase cop production, purify drinking water, give businesses efficient manufacturing operations, and they are found around almost every household. Hazmat situations can occur during production, storage, disposal or transportation. That is why a fully compliant and dependable Hazardous Materials Storage Building is necessary when storing, transporting, or disposing of hazardous materials. If hazmat is stored improperly, the community and environment may be at risk. Hazardous materials can cause serious injury, long-lasting health problems, fines and even death. Hazardous Material Buildings provide excellent storage solutions for hazardous materials. 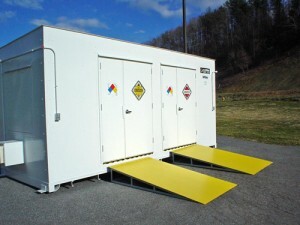 U.S. Chemical Storage manufactures 100% fully compliant hazmat storage buildings for all of your hazmat storage needs. Offering 100% customizable construction for all of our hazmat storage buildings to tailor to your exact specifications. Our Hazmat Storage Building is built from hand-welded, heavy-duty, 12-gauge steel for complete protection. Offering 2-hour fire rated and 4-hour fire rated hazmat storage buildings for your specific hazmat storage needs. U.S. Chemical Storage provides expert advice for all of our products and we offer the strongest and most dependable chemical storage buildings available.